A brilliant, massive sandbox of systems, albeit largely the same one Bethesda has been making for years. What is it? A post-apocalyptic sandbox RPG. Let me tell you about my Vault dweller. She's a master of stealth in flame red power armour. Protected by her hulking exoskeleton, she stomps quietly through buildings—efficiently dispatching her enemies with a sword or silenced pistol. Sometimes, the dozen or so raiders she's hunting will realise that something's amiss. They'll search the area, making threats about what they'll do should they find the lumbering behemoth crouched unseen in the corner. Occasionally she'll watch as they fail to notice how there's a mass of metal armour with a hot rod paint job right in front of their faces. Then she'll murder them with a single bullet to the head. For me, this has been Fallout 4. It's a highly customisable RPG in a world that's packed full of things to do. Its systems are intricate, and invite you to tailor them to your liking. When you do, it can be wonderfully satisfying, but also—in the sense that you can be a huge stealth machine carrying an antique, irradiated sword—a little bit dumb. Fallout 4 wilfully trades immersion for an enjoyable, freeform sandbox of possibilities. Whether you'll enjoy it or not, I think, depends on your reaction to the description above. Does it sound like an infuriating, dissonant mess, or the cool, emergent intersection of player-driven decisions. I'm in the latter camp. If you've played a Bethesda RPG before, this will be nothing new. As Fallout 3 was to Oblivion, so Fallout 4 is to Skyrim—the post-apocalypse of a futuristic world trapped in a '50s aesthetic, now available in Bethesda's Creation Engine and boasting some interesting new features. But for all the improvements, the moment to moment experience is broadly the same. Journeying to one of the many undiscovered locations in your vicinity, you'll kill enemies, pick locks, hack terminals, collect loot and experience a standalone vignette that weaves into the larger story of Boston after the bombs. 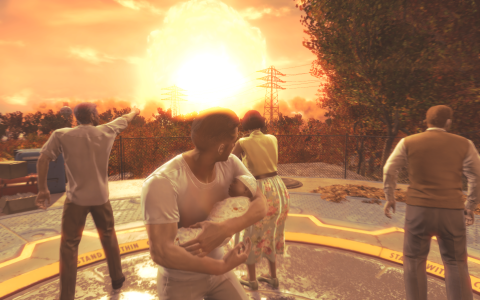 Fallout 4 is set in a condensed version of Massachusetts, known as the Commonwealth. Its map incorporates much of the state's east coast, from Salem to Boston itself—squished down like a Euro Truck Simulator 2 version of the end of the world. It opens on the day of Fallout's apocalypse—giving you the brief chance to experience life in the pastel-painted sanctuary of Sanctuary before it gets reduced down to rubble. This taste of the pre-apocalypse isn't all that revelatory. Unsurprisingly, the world was nicer when there weren't mutated dogs trying to eat your face off. But the opening speaks to the fact that Bethesda has tried to make a more memorable main campaign. The world was nicer when there weren't mutated dogs trying to eat your face off. In fact, this is the best main story Bethesda has created. That's not a high bar to clear, but, for once, embarking on a main quest doesn't feel like a distraction. Your character leaves the Vault over 200 years after the apocalypse, in search of her (or his) kidnapped son. It's a simple, primal motivation, but one that's effective in leading you on a journey to the Commonwealth's main conflict: the appearance and distrust of human-like synths, and their connection to the mysterious Institute. The story succeeds because it ties in more closely to the side-plots that Bethesda has always been better at creating. The factions and companions you meet along the way are crucial to the overall plot. I had a lot of fun playing the factions off against each other, leading them inexorably to a dramatic finale. Then, it ends. As world shifting as the events you enact potentially are, they're dampened by the abruptness of the conclusion. I should have expected this, of course—I played Skyrim—and perhaps it speaks to how much I was enjoying those final missions that their resolution left me feeling flat. As always, then, the campaign is just the throughline for the many, many sidequests, miscellaneous events and unprompted acts of exploration you'll complete along the way. Bethesda's Fallout games are primarily about the atmosphere of the world at large, and Fallout 4 is no different. It's brutal and harrowing, but only up to a point. There's a lightheartedness that chips away at the tone, softening the death and decay. Fallout 4, like its predecessors, isn't a survival game—even though, initially at least, resources can be hard to come by. Graphically, Fallout 4 looks like an improved version of Skyrim. Which is to say that it looks like an improved version of Fallout 3. That's mostly down to the tech powering it—even some of the NPC animations will be recognisable to anyone who's spent enough time in Tamriel. The faces are better, but still not perfect. The voice acting is much better, but still not perfect. Initially, I experienced the mild disappointment of familiarity. Four years after Skyrim, I was hoping for a more pronounced improvement. Now I wonder if I couldn't see the forest for the low resolution tree textures. The age and limitations of Bethesda's engine are well apparent, but the Commonwealth is enticing. On the macro level, Fallout 4's scale and detail creates a world that feels cohesive and full of perverse charm. Boston is a great setting. It's denser than the Capital Wasteland of Fallout 3, and more colourful. There's a lot of grey and brown, sure, but also reds, blues and deadly, glowing greens. The locations, and the people who inhabit them, imbue the world with character. Diamond City, one of the main locales, is a town built in Boston's Fen stadium. As a collection of shacks and huts, it feels similar to Megaton—but more interesting, and more appropriate to the setting. Like New Vegas before it, Fallout 4 isn't about a post-apocalypse, but rather a post-apocalypse in a specific, recognisable place. Elsewhere, there's the Glowing Sea—a murky, barren expanse that still manages to be one of the most atmospheric places I've been to this year. A huge part of Fallout 4's appeal is the sense of discovery and mystery. Each location feels crafted, and that gives a powerful reason to investigate. Maybe you'll find a text logs that detail a conflict between rival gang leaders, or just a note explaining how to access a hidden stash of loot. The world feels lived in and dangerous, and it's fun to pick apart its history. That said, I do wish it was a bit stranger—or even more playful. I'm in dangerous territory here, because there are so many sidequests that I haven't found or finished. For all I know, there's plenty of weird and unexpected encounters to discover. But I'm yet to find anything outside of the main quest that's as odd as Fallout 3's Vault full of Gary clones, or as dramatic as the decision to let a group of ghouls murder an apartment block full of rich jerks. I love the idea of the Vaults as weird social experiments, but of the three I've visited—my own character's included—none have delivered a compelling hook. One had a great idea behind it, but the delivery was underwhelming. I'm yet to find anything as odd as Fallout 3's Vault full of Gary clones. In general, there seems less scope to be a pantomime villain. I think part of the reason for this is that my character feels like a more fully formed person. It helps that she's fully voiced—every decision picked from the conversation wheel resulting in a sentence or two of spoken dialogue. There's still plenty of scope for imprinting your own whims onto the Vault dweller's personality, but it happens in a more strictly defined way. My character just didn't seem like she'd nuke a town full of people for a handful of caps. She's nice like that. Graphics options Texture quality, shadow quality, shadow distance, decal quality, lighting quality, godrays quality, depth of field, ambient occlusion, screen space reflections, wetness, rain occlusion, motion blur, lens flare and anisotropic filtering. Fallout 4 ran solidly—the Creation Engine's age and PC focus ensuring a wide range of customisable options ensuring solid stability. It was mostly bug free, and I only encountered a couple of mysterious crashes-to-desktop in over 50 hours of play. Running on a beefy graphics card, it performed admirably on ultra—only occasionally dropping below 60fps while exploring outdoors. I mostly put this down to the fact that I was streaming the Starcraft 2 WCS final on a second screen at the time. There are, however, plenty of loading screens to endure—particularly as you fast travel around the world. Having a voiced protagonist gave me a greater sense of attachment to the world, and particularly to the companions. This is the first Bethesda RPG where I've consistently had an NPC along for the ride. For once, they're much more than a mule to carry excess weapons. My second favourite companion, Nick Valentine, is an old school private eye—complete with trenchcoat and fedora. He inserts himself into conversations, and will stop and chat to other NPCs that he's previously helped. It's nice to get a sense, however small, that the world doesn't just exist for the Vault dweller to be in it. My favourite companion is the dog, because it doesn't judge me when I steal all the telephones from a house. I have a lot of telephones in my pockets, as well as microscopes, alarm clocks and dinner trays. It's why I took to wearing power armour—so I could carry all the crap that I was collecting on my travels. If you love obsessively liberating a place of all its items, then good news: everything in Fallout 4 is useful. That's because of the new settlement system. Settlements are Fallout 4's major new feature—like Skyrim's Hearthfire DLC, but massively expanded. Gain ownership of a settlement and you can construct new items, from water pumps and gun turrets, to prefabricated structures. Each has a resource cost associated with it. A wall panel simply requires wood and steel, but something like a defensive turret is more complex—the more deadly ones needing aluminium, circuitry, gears, fiber optics, and a generator for power. Open the crafting workshop in a settlement, and a green outline will show the area you're allowed to build in. Within this space, you can also scrap items for resources. That's fine for turning trees, cars and loose tires into wood, steel or rubber, but rarer resources must be found or purchased out in the world. And so you collect junk. Every item in the game is made out of resources. Dump them into a settlement's workshop, and they can be turned into something useful. A typewriter becomes a useful source of gears, screws and springs—handy for building machinery that can defend your settlement from raiders. It's gratifying to watch an area turn from a run-down ghost town into a functioning settlement. Nevertheless, the workshop interface is a bit fiddly to use. Buildings are organised into categories, and it's a pain having to switch back and forth trying to remember if the radio beacon that attracts new settlers was in ‘Power > Miscellaneous’ or ‘Resources > Miscellaneous’. Worse still, your workshop's resource pool isn't global, but tied to each specific settlement. You might have enough oil to worry a flock of seagulls, but you can't build a generator in Tenpines Bluff if you left it all in Sanctuary Hills. At one point, I had to fast-travel between multiple different settlements just to remember where I'd left the pocket watch that contained the gear I needed to build a water pump. You can build supply lines that share resources between two connected workshops, but it's a clumsy system, and impractical unless you've already put in the work to grow a settlement's population. I have a lot of telephones in my pockets. You'll get a fair few settlements if you do missions for the Minutemen faction—a local militia group that's working to make the Commonwealth safe for decent, hard-working folk. It can become a bit overwhelming. Each settlement needs a number of resources: food, water and beds. The more you have in a settlement, the more defensive structures you'll need to protect it. Occasionally, you'll get alerts to defend these places. A few of my settlements were wiped out, either because I was too busy having fun adventures against super mutants or just didn't see the mission prompt that alerted me to their danger. Guns have a crafting system, too—letting you create mods that alter their scopes, barrels, grips and attachments in a variety of ways. This, to me, felt like a much better use for my growing collection of minutia. Guns are the best thing about Fallout 4. Unlike its predecessors, it's an accomplished and enjoyable shooter. While my preference was for silenced weapons, the scarcity of ammo—at least for the first couple of dozen hours—forced me to experiment. I didn't mind. Getting into firefights is a joy, to the point that, by the end, I'd all but entirely abandoned the VATS system. Early weapons picked off of raiders are relatively weak, but, as you journey through the Commonwealth you're guaranteed to find a collection of favourites. Early on, you get access to a laser musket—a powerful rifle that needs to be cranked between each shot. Using it feels tense and frantic, requiring you to dive into cover to hammer the R key, before popping out and taking your shot. With mods, you can imbue a musket with up to six charges. It's a deadly thing, if you've got the space to fully load it. The best guns and armour are scavenged off of legendary enemies, identifiable by the star next to their name. When downed, they'll drop a legendary item with a special benefit. I've got a Tommy gun that fires exploding bullets, a dual-barrel shotgun that never needs reloading, a chest piece that turns me invisible when crouched and not moving, and, of course, an irradiated sword. I can't bear to part with any of these. I'd sooner throw away my precious telephones. One effect of Fallout 4's immediate familiarity is that I'm more conscious than ever of the flaws of the engine. I haven't experienced many bugs, but there are lots of quirks. AI NPCs, for examples, like to run off at inopportune moments in response to some faraway threat that they've decided to deal with. In one instance, a pair did this during a forced scripted sequence—leaving me stranded and unable to move. With so many systems working to create interesting, emergent experiences, sometimes things break down. As a whole, though, it's a loving production. It's filled with care and attention to detail—like the expanded set of radio stations, or the way flash radiation storms bathe the world in a sickly, ominous green hue. It's a pleasure to pick through the world, to discover new sights, and to pick through the perks and customisation option to conceive the perfect character build, however bizarre. In short, many of Fallout 4's problems, like every Bethesda RPG before it, are a consequence of what makes them unforgettable. That might not be the neatest conclusion, but it explains why, 50 hours in, I'm still having fun. It also explains why, now that I've finished this review, I'm going to play it for many hours more.